Ferredoxins are small iron-sulfur proteins belonging to all domains of life. A sub-group binds two [4Fe-4S] clusters with unequal and extremely low values of the reduction potentials. These unusual properties are associated with two specific fragments of sequence. The functional importance of the very low potential ferredoxins is unknown. A bioinformatic screening of the sequence features defining very low potential 2[4Fe-4S] ferredoxins has revealed the almost exclusive presence of the corresponding fdx gene in the Proteobacteria phylum, without occurrence in Archaea and Eukaryota. The transcript was found to be monocistronic in Pseudomonas aeruginosa, and not part of an operon in most bacteria. Only fdx genes of bacteria which anaerobically degrade aromatic compounds belong to operons. As this pathway is not present in all bacteria having very low potential 2[4Fe-4S] ferredoxins, these proteins cannot exclusively be reductants of benzoyl CoA reductases. Expression of the ferredoxin gene did not change in response to varying growth conditions, including upon macrophage infection or aerobic growth with 4-hydroxy benzoate as carbon source. However, it increased along the growth curve in Pseudomonas aeruginosa and in Escherichia coli. The sequence immediately 5' upstream of the coding sequence contributed to the promotor activity. Deleting the fdx gene in Pseudomonas aeruginosa abolished growth, unless a plasmid copy of the gene was provided to the deleted strain. The gene of the very low potential 2[4Fe-4S] ferredoxin displays characteristics of a housekeeping gene, and it belongs to the minority of genes that are essential in Pseudomonas aeruginosa. These data identify a new potential antimicrobial target in this and other pathogenic Proteobacteria. Ferredoxin (Fdx) is the name given to a variety of small proteins binding inorganic clusters organized around two to four iron atoms and a complementary number of sulfur atoms . Complete genomic sequences have revealed the presence of a very large number of genes encoding such proteins, mainly in bacteria and archaea . Fdxs are most often assigned electron transfer roles and some of them occupy central positions in metabolism , but the roles of a majority of Fdxs remain unknown [4, 5]. Functional substitution among Fdxs may occur, and other soluble electron shuttles, such as flavodoxins, may act as Fdx-substitutes. This is the case upon iron starvation for a 2[4Fe-4S] Fdx in glycolytic Clostridia  or a [2Fe-2S] Fdx in some photosynthetic organisms , for instance. Despite this apparent functional redundancy, most sequenced genomes display a wealth of genes encoding various Fdxs. For example, the reference PAO1 strain of the opportunistic pathogen Pseudomonas aeruginosa  has at least 6 genes encoding Fdxs of different families. A flavodoxin (PA3435) is also present in this strain. It is often unclear in which reactions Fdxs are involved and which biological function relies on a given Fdx. One of P. aeruginosa Fdxs is encoded by the PA0362 locus (fdx1) and it belongs to a separated family of proteins containing two [4Fe-4S] clusters . The sequences of proteins of this family are characterized by a segment of six amino acids between two cysteine ligands of one cluster and a C terminal extension of more than 20 amino acids beyond the last ligand of the other cluster (Figure 1). The structure of this Fdx  shows that these two characteristic peptides fold as a particular turn close to one cluster and as a turn and a long α-helix, respectively (Figure 1). The first member of this family (hereafter abbreviated AlvinFdx) to be identified was that of the purple sulfur γ-proteobacterium Allochromatium vinosum, originally named Chromatium vinosum, and it was initially classified among other [4Fe 4S] 'bacterial' Fdxs (as opposed to 'plant' [2Fe 2S] Fdxs) . It was later found that the characteristic sequence differences of proteins of the AlvinFdx family shifted the reduction potential of the [4Fe 4S] clusters to very negative values, below -450 mV with reference to the Normal Hydrogen Electrode, with one reaching -650 mV or less . Because of this unusual property, it is not easy to find an efficient physiological reductant for such proteins, especially in non-photosynthetic organisms. Additional unique spectroscopic  and structural [10, 14, 15] properties have also been evidenced in these proteins. Characteristic features of Fdx of the AlvinFdx family. (A) Sequence alignment of selected 2[4Fe-4S] Fdxs from γ-proteobacteria Pseudomonas aeruginosa PAO1, Allochromatium vinosum DSM180, Escherichia coli K12-MG1655; δ-proteobacteria Anaeromyxobacter dehalogenans 2CP-C, Plesiocystis pacifica SIR-1; ε-proteobacteria Helicobacter pylori 26695, Campylobacter jejuni NCTC 11168, Cj0354 sequence; Chloroflexi Dehalococcoides sp. VS; β-proteobacteria Azoarcus sp. (or Aromatoleum aromaticum) EbN1 (locus NT01AE0820), Thauera aromatica K172; α-proteobacteria Rhodopseudomonas palustris CGA009; Clostridium acidurici as an example of heterotrophic anaerobic bacteria; Azoarcus sp. EbN1 (locus NT01AE3314) belonging to the bcr cluster; Campylobacter jejuni NCTC 11168 Cj0333 sequence. n X stands for insertions of n aminoacids. Stars on the consensus line for proteins of the AlvinFdx family indicate identical residues and colons are for conserved residues. The ① and ② symbols lie under non-conserved residues belonging to the fragment between cysteine ligands and the turn and helix addition, respectively, that characterize the AlvinFdx family as indicated in the structure of Figure 1B. The lengths of the compared sequences are given at the end of the alignment, and [4Fe-4S] cysteine ligands are boxed. (B) View of the P. aeruginosa Fdx structure . The general fold is shown (light grey tube) with the 8 amino acid stretch between two cysteine ligands of one cluster (labelled ①) and the turn and helix at the C-terminus ② colored in dark grey. Iron and inorganic sulfur atoms are represented as spheres. A well defined function for members of this family of Fdxs has only been found in bacteria catabolizing aromatic compounds in the absence of oxygen . The Thauera aromatica Fdx participates in an electron transfer chain, as electron acceptor from 2-oxoglutarate:Fdx oxidoreductase and donor to benzoyl-CoA reductase . However, this particular Fdx displays the less negative reduction potentials among Fdxs of the AlvinFdx family , and this catabolic pathway is not always present in all bacteria containing fdx genes (i.e. genes encoding Fdxs similar to that of AlvinFdx). Since the role of Fdxs of the AlvinFdx family is not known in most bacteria (those that do not anaerobically catabolize aromatics), the importance of the fdx1 gene of the P. aeruginosa PA0362 locus has been investigated in the present work. The possibility of endogenous in vivo functional substitution has been examined by removing the chromosomal copy of the gene. Also, the main properties of fdx1 expression have been explored and the distribution of similar genes has been analyzed in the available sequence databases. These newly obtained data strongly indicate a non-exchangeable and housekeeping function for fdx1. The signature of AlvinFdx sequences encompasses two components. First, a 6-7 amino acids insertion separates two iron-coordinating cysteines of one cluster, whereas [4Fe-4S] clusters in Fdxs are usually bound by a stretch of three cysteines, two residues apart in the sequence. Second, a 27-43 amino acids fragment, following the last coordinating cysteine at the C-terminus, partly folds as an α-helix (Figure 1). Over the last 15 years, extensive genome sequencing has revealed numerous fdx genes encoding protein sequences with characteristics of the AlvinFdx family, but no systematic inventory has been carried out. Peptidic insertions may change the properties of proteins in unpredictable ways, as exemplified by the large differences between the Fdxs studied here and more conventional, shorter (ca. 55 amino acids) 2 [4Fe-4S] ones [12, 13, 15]. Therefore, the present analysis is restricted to proteins of no more than 100 amino acids showing the above two sequence features. Genes encoding proteins with the above characteristics in the sequence databanks were only found in the (eu)bacterial domain: more than 200 such genes were detected. Although Archaea are a very abundant source of iron-sulfur proteins, no genes encoding proteins of the AlvinFdx family, as precisely defined above, could be identified in this domain. Within bacteria, the occurrence of fdx genes was restricted to Chloroflexi (in only the Dehalococcoides genus), to Nitrospirae (in only the Leptospirillum genus), and to the Proteobacteria. In the latter phylum, all α to ε classes were represented (Figure 1A), but with noteworthy differences. All fully sequenced species of β- and ε- Proteobacteria displayed the fdx gene, which was also present in a large number of, but not all, γ-Proteobacteria. In contrast, the fdx gene was found in only a minority of the δ-Proteobacteria genera (Anaeromyxobacter, Plesiocystis, Sorangium), and in only one species, Rhodopseudomonas palustris, of α-Proteobacteria. In Rhodopseudomonas palustris , and in the denitrifying β-Proteobacteria, Thauera aromatica  and Azoarcus sp. strain CIB , the fdx gene belongs to a cluster of genes involved in anaerobic catabolism of aromatic compounds (Figure 2). In Thauera aromatica, Fdx receives electrons from 2-oxoglutarate:Fdx oxidoreductase and donates them to benzoyl-CoA reductase, the ATP-dependent dearomatizing enzyme . By similarity, the fdx gene likely belongs to a catabolic operon  in the other anaerobic benzoate-degrading bacteria displaying clustered homologous genes [19, 21]. Genomic context around genes of the AlvinFdx family in selected bacteria. The predicted ORFs neighbouring fdx are approximately drawn to scale (shown at the bottom) with arrows indicating the direction of transcription. Genes and encoded proteins: P. aeruginosa PAO1: PA0364, probable oxidoreductase; coaD, phosphopantetheine adenylyltransferase; PA0361, probable γ-glutamyltranspeptidase precursor; PA0360, conserved hypothetical protein. 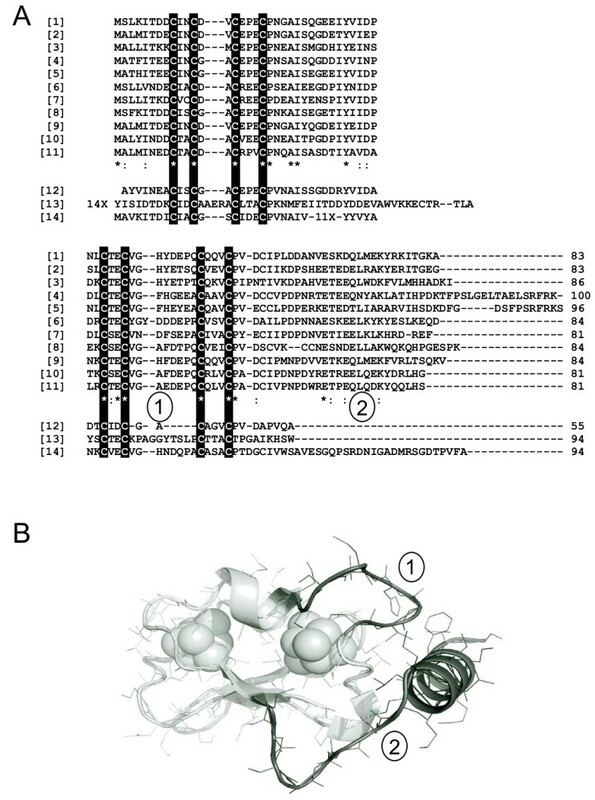 E. coli K12-MG1655: yfhH, conserved hypothetical protein; acpS, CoA:apo-[acyl-carrier-protein] pantetheinephosphotransferase; pdxJ, pyridoxin 5'-phosphate synthase; recO, protein that interacts with RecR and possibly RecF proteins. H. pylori 26695: addB, ATP-dependent nuclease; HP0276, hypothetical protein; gppA, guanosine pentaphosphate phosphohydrolase; rfaC, lipopolysaccharide heptosyltransferase-1. T. aromatica: bcrAD, two of the four subunits of benzoyl-CoA reductase; orf1 and orf2, hypothetical proteins. The Figure was prepared with tools available at http://cmr.jcvi.org and with the data in . A case of interest is that of Azoarcus sp. EbN1 (called Aromatoleum aromaticum strain EbN1 in the most recent literature) which anaerobically degrades aromatics and displays a ferredoxin gene (improperly designated by fxd) in the bcr (benzoyl CoA reductase) genomic cluster . Although it most probably binds two [4Fe-4S] clusters, the "Fxd" ferredoxin does not have the sequence characteristics of Fdx (sequence  of Figure 1A). Furthermore, in another part of the genome downstream of the pantetheine-phosphate adenylyltransferase gene (coaD), Azoarcus sp. EbN1 does have a fdx gene (locus NT01AE0820, sequence  of Figure 1A), potentially encoding a Fdx of the AlvinFdx family. Thus it seems unlikely that the latter Fdx participates in the anaerobic degradation of aromatics in this bacterium. The coaD gene was found on the 5' side of fdx in several bacteria including P. aeruginosa PAO1. However, the involvement of Fdx in the reaction catalyzed by phosphopantetheine adenylyltransferase has not been demonstrated, and the very high-energy electrons Fdx may provide are not required in the CoA biosynthetic pathway. Thus, coaD and fdx1 do not need to be functionally linked. Furthermore, coaD and fdx1 are not always close in the sequences of many genomes, in E. coli K12-MG1655 for instance (Figure 2), and the layout around fdx is highly variable (Figure 2). In P. aeruginosa PAO1, a gene encoding a probable γ-glutamyltranspeptidase is located 3' of fdx1. This is also the case for some other strains of P.aeruginosa and for bacteria of the Xanthomonas and Xylella genera, but this layout is not largely conserved, even within the Pseudomonas genus (Figure 2). Therefore, the transcriptional characteristics of fdx, not belonging to bcr clusters, have been explored. Northern blot analysis of P. aeruginosa mRNA revealed a single band of less than 500 nt hybridizing with a fdx1 probe (Figure 3A), both in the PAO1 and CHA strains. The small size of the P. aeruginosa fdx1 transcript indicates that the transcription start site must be close to the coding sequence and that it is monocistronic. Expression of P. aeruginosa fdx1. (A) For Northern blots, total RNA was hybridized to a [32P]-dCTP-labelled fdx1-probe after electrophoretic separation and the autoradiogram shown is representative of several experiments. (B) The fdx1 transcript was detected by RT-PCR as a 136 bp amplicon and compared to the reference 350 bp-rRNA. 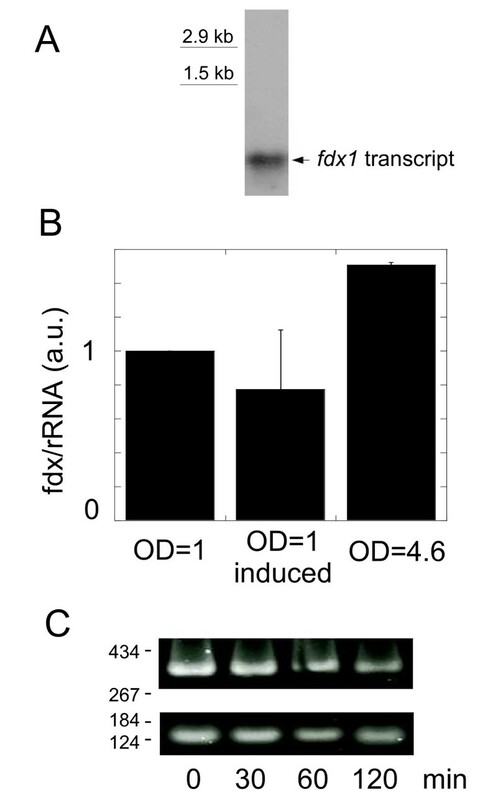 The ratio fdx1/rRNA was arbitrarily set at 1 for cells at OD = 1, and compared with induced (i.e. calcium-depleted for T3SS induction) cells, and OD = 4.6 cells. Cumulative data from 3 experiments with standard error. (C) Time course evolution of the rRNA control (upper panel) and the fdx1 transcript (lower panel) after OD = 1-cells had infected J774 macrophages at multiplicity of infection of 10. The time of contact with macrophages is indicated in minutes and the size scale in bp is on the left of the panels. The 1 kb regions 5' of the coding sequences of the E. coli, P. aeruginosa, and Helicobacter pylori Fdxs do not share recognition sequences for common transcription factors. Promoter activity of the 5' sequence of E. coli yfhL (the fdx gene in this bacterium) was qualitatively reported before . We also detected the yfhL, i.e. fdx, mRNA by RT-PCR (data not shown). To look for regulation, measurements of the P. aeruginosa fdx1 mRNA levels have been carried out under different conditions. It was found that the relative expression of fdx increased along the growth phase (Figure 3B, see also below Figure 4C). Since P. aeruginosa is an opportunistic pathogen, we wondered whether fdx1 expression was also triggered during host-bacterium interaction or co-regulated with other virulence factors. Calcium depletion by EGTA to chemically induce synthesis of the Type 3 Secretion System (T3SS) , a major virulence factor of P. aeruginosa, did not change the expression of fdx1 (Figure 3B). T3SS is naturally induced when bacteria contact host cells . Yet, P. aeruginosa cells in the presence of macrophages showed similar amounts of fdx1 mRNA, relative to rRNA, from the time of contact up to 2 hours later (Figure 3C). β-Galactosidase activities in P. aeruginosa strains containing chromosomal lacZ fusions to the fdx1 5' sequence. (A) Scheme of the two constructs used to monitor transcriptional activities of the fdx1 promoter. The -529 and -200 positions are relative to the +1 start of translation. (B) Relative β-galactosidase activities triggered by the constructs in (A) under normal conditions (white bars), for calcium depleted (for T3SS induction) cells (black bars), and for cells grown under semi-aerobic conditions with KNO3 (gray bars). (C) β-galactosidase activities were measured in pFdx1Z and pFdx1shortZ strains grown in LB medium at the indicated OD600. The reported activity values are the average of at least two independent experiments performed in duplicate or triplicate. Error bars indicate standard deviations. To get insight into the promoter region of the P. aeruginosa fdx1 gene, the fragment [519 +26] (relative to position + 1 of translation) was transcriptionally fused to the promoter-less lacZ gene (Figure 4). This construction, which contains a 5' truncated version of the coaD coding sequence, was introduced in the attB site of the P. aeruginosa CHA genome. The [519 +26] fragment was found to promote lac Z transcription. Transcription of fdx1 was independent of calcium depletion and of the presence of ExsA (data not shown), the key transcription factor of T3SS genes, in agreement with the results of RT-PCR experiments (Figure 3). Along the growth curve, β-galactosidase activity rose from 400 Miller Units at early logarithmic phase to more than 800 when reaching the stationary phase (Figure 4C), again in agreement with the results of RT-PCR experiments (Figure 3B). Another construction with 200 bp, instead of 519 bp, upstream of the fdx1 coding sequence, and devoid of any coaD sequence, gave ca. 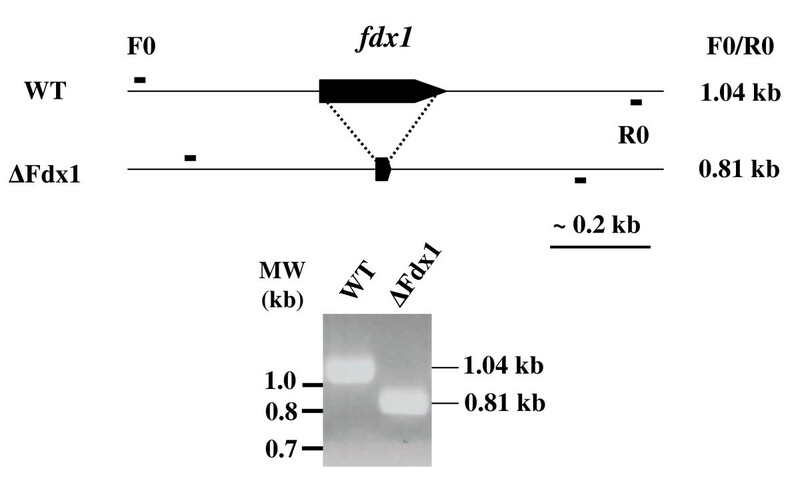 3 fold lower activities, indicating that the [-519 -200] region enhances transcription of fdx1. The number of Miller units of β-galactosidase activity also increased with the biomass under the dependence of the shortened version of the promoter region (Figure 4), as was observed with the longer one. Removing oxygen from a rich nitrate-containing medium did not change the difference between the long and shorter versions of the promoter region (Figure 4). The carbon source (glucose or pyruvate), as well as the nitrogen one (ammonium ions or nitrate), in a minimal medium did not impact the β-galactosidase activity (data not shown). Since some Fdxs of the AlvinFdx family are involved in the degradation of aromatic compounds, P. aeruginosa was cultivated with 4-hydroxy benzoate as sole carbon source: in the presence of nitrate and without oxygen, P. aeruginosa did not grow, thus indicating that the catabolic benzoyl CoA pathway is not present in this bacterium, in agreement with the lack of benzoyl CoA reductase in the P. aeruginosa genome. This result excludes a single benzoyl CoA-reducing role for Fdx in all bacteria in which the fdx gene has been found (see above). Despite the very large number of fdx genes present in proteobacteria, proteins of the AlvinFdx family have only been purified from Allochromatium vinosum [9, 11], T. aromatica , and Azotobacter vinelandii : growth of A. vinosum was on synthetic medium lacking aromatic compounds , whereas benzoate was the unique carbon source of T. aromatica . With oxygen as electron acceptor, P. aeruginosa grew on 4-hydroxy benzoate with expression of fdx1 at a rate similar to growth on glucose or pyruvate. This confirms that the aerobic pathway of 4-hydroxy benzoate catabolism is active in P. aeruginosa, but it does not require a larger fdx1 expression than for growth on glucose or pyruvate. To assess the functional importance of P. aeruginosa Fdx, inactivation of the fdx1 gene was carried out. The suicide plasmid pEXΔFdx1 contained a fragment of 762 bp encompassing fdx1 from which the coding sequence between the sixth and the last 12 nucleotides was removed and replaced by a Xho I restriction site. Two other plasmids in which a Gm R cassette was cloned in both orientations, using this Xho I site, were also prepared. 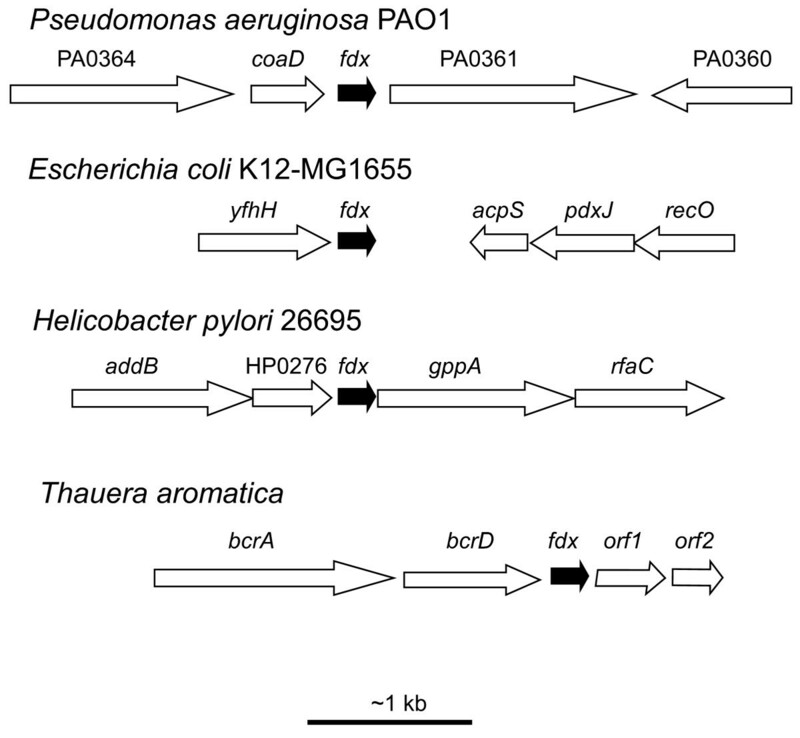 All three plasmids were introduced in the P. aeruginosa CHA strain by homologous recombination. The use of the cassette-less construction aimed at avoiding any polar effect triggered by the introduced DNA. Numerous attempts at excising fdx1 consistently afforded the wild-type genotype: this suggests that fdx1-deleted bacteria were selected out with this experimental strategy. Disrupting the P. aeruginosa fdx1 gene by directly integrating a pEX100T-based suicide plasmid into the chromosomal coding sequence (see Materials and Methods) also failed to afford viable mutants. Clones in which the genomic copy of fdx1 was deleted (Figure 5) only grew when a functional copy of the fdx1 gene was provided in trans, either on the pVLT-pFdxS plasmid (gene under its own and pTac promoters) or on the pJN-Fdx1 plasmid (gene under pBAD control), prior to integrated-plasmid counter-selection. This procedure gave around 50% of clones in which the PA0362 locus was deleted, as verified by PCR analysis. Consistently, curing the mutants of the plasmid copy of fdx1 did not allow us to select colonies lacking the chromosomal copy of the gene. These results indicate that the plasmids bearing fdx1 rescued the cells that had lost chromosomal fdx1, but complete lack of the gene was deleterious to P. aeruginosa growth. Hence this gene is essential for the P. aeruginosa CHA strain. Evidence for removal of the genomic version of P. aeruginosa fdx1. The schematic arrangement of the genome before (WT) and after (Δ Fdx1) mutagenesis is shown above the gel with the PCR fragments amplified with the FDX-F0 and FDX-R0 primers (Table 1). The CHA cells used in this experiment contained the pVLT-FdxS plasmid with a copy of the fdx1 coding sequence, but without sequences complementary to the FDX-F0 and FDX-R0 primers. The fact that fdx1 is essential in P. aeruginosa challenges any speculation about its function. The present work shows that this gene is indeed expressed in P. aeruginosa (Figure 3), but little previous work addressed its regulation. The transcriptome subset varying between biofilm and planktonic cultures of P. aeruginosa PAO1 has been reported : fdx1 transcription was increased ca. 3 times in biofilms as compared to free living bacteria. However, such variations were not confirmed in another similar study . Considering other members of the AlvinFdx family, one of the two fdx genes in Campylobacter jejuni (sequence  of Figure 1A) was found to be iron-regulated and involved in the aerobic survival of cells in the stationary phase . The sequence of another Fdx of this bacterium (sequence  of Figure 1A) is more similar to the Fdx consensus. We could not demonstrate iron regulation for the single fdx gene of P. aeruginosa or E. coli (not shown), in line with previous results obtained with H. pylori  and P. aeruginosa . H. pylori strains are of particular interest since their only annotated ferredoxin gene is of the type discussed here. The encoded protein has been associated with metronidazole resistance, at least for some strains [34, 35], including because it is suspected to donate electrons to a nitroreductase (the product of the frxA gene) that is required to activate the drug. The observation that the gene could be deleted in some, but not all, H. pylori strains  did not help assigning a function to Fdx. In particular, the actual involvement of Fdx as low potential electron shuttle between oxidoreductases in H. pylori as suggested  remains to be clearly delineated since Fdx proteins have been shown to be poor electron donors/acceptors in coupled reactions using such enzymes [36, 37]. Indeed, flavodoxin has been assigned this role in H. pylori and C. jejuni . Furthermore, the induced high-level expression of frxA resulting from the deletion of fdx in some H. pylori strains suggested a repressor function for fdx and additional important, but undefined, roles . The genome context around the fdx genes is not conserved in different bacteria, and evidence for transcription as part of an operon is lacking, with the exception of clusters of genes involved in the anaerobic degradation of aromatic compounds [19–21]. In P. aeruginosa several, often putative, oxidoreductases can be identified in the analysis of the genome, and many low-potential electron transfer molecules coexist. P. aeruginosa fdx1 is transcribed as a short messenger in a constitutive-like manner, and our attempts at deleting fdx1 indicated that it belongs to the minority of essential genes (estimated around 10% ) in this bacterium. This conclusion agrees with the absence of P. aeruginosa transposon mutants for PA0362, both in PAO1 http://pseudomutant.pseudomonas.com/index.html and PA14 http://pga.mgh.harvard.edu/Parabiosys/projects/host-pathogen_interactions/library_construction.php libraries. An exception is in a library with phoA and lacZ insertions, in which the PA0362 locus was targeted in two mutants . These insertions occur in the genomic sequence very close to the 3' end of the fdx1 ORF. Therefore, most of P. aeruginosa Fdx should be synthesized in these mutants: the variability of the C-terminus among Fdxs and inspection of the structure (Figure 1) indicate that the insertions should not completely inactivate Fdx in these mutants. The data presented herein demonstrate that donation of electrons to benzoyl-CoA reductase cannot be the sole function of ferredoxins of the AlvinFdx family. The lethality of fdx1 removal indicates that functional substitution of Fdx by other proteins of P. aeruginosa does not occur, maybe because the product of fdx1 fulfils other functions than conventional electron transfer between redox enzymes. This possibility was previously inferred by changes in frxA expression upon fdx removal in strains of H. pylori . Similar suggestions arose from various kinds of data obtained with other small iron-sulfur proteins, such as thioredoxin-like ferredoxins  and the [2Fe-2S] isc-associated Fdx of E. coli in the secretion of cytotoxic necrotizing factor 1 . Potential regulating mechanisms involving Fdx cannot be discussed at this stage, but they may include stabilization of proteins or protein complexes, electron exchange with redox-sensitive regulators, and others. As detailed above, many bacteria of the Proteobacteria phylum, such as Francisella tularensis, Neisseria meningitidis, or Yersinia pestis among many, contain the fdx gene and they are human pathogens. If this gene is essential in many of them, as shown here for P. aeruginosa, proteins of the AlvinFdx family may provide new targets for future antibiotics. The P. aeruginosa strain used in most experiments is the cystic fibrosis isolate CHA strain , but some experiments were also carried out with the reference PAO1 strain. Escherichia coli Top10 (Invitrogen) strain was used for standard cloning experiments. P. aeruginosa was grown on Pseudomonas Isolation Agar (PIA; Difco) plates or in liquid Luria Broth (LB) medium at 37°C with agitation, and the antibiotics used for selection on plates were carbenicillin (Cb) 500 μg/ml, tetracycline (Tc) 200 μg/ml, and gentamycin (Gm) 200 μg/ml. For experiments aiming at measuring fdx1 expression under different conditions with the LacZ reporter activity, P. aeruginosa was diluted to an optical density of 0.1 at 600 nm (OD600) in the required medium. To induce the type 3 secretion system (T3SS), the P. aeruginosa cells were diluted in LB supplemented with 5 mM EGTA and 20 mM MgCl2. Control (no T3SS induction) cells were diluted in the same medium with 5 mM CaCl2. P. aeruginosa cells were grown for an additional 3 hours to a final OD of 1.0 before measurement of LacZ activity. To study the interaction with macrophages, the murine cell line J774 (ATCC) was grown in Dulbecco's modified Eagle medium (Gibco) supplemented with 10% heat-inactivated fetal calf serum (Gibco). Macrophages were seeded in 75 cm2 culture flasks (BD Falcon) 20 hours before infection. P. aeruginosa cells were grown in LB up to an OD600 of 1.0. The J774 macrophages (1.8 × 107 per flask) were infected with bacteria at a multiplicity of infection of 10 for 1 or 2 hours. The supernatants were then withdrawn and the non-phagocytosed bacteria were harvested by centrifugation prior to RNA purification. In semi-aerobic growth conditions, overnight P. aeruginosa cultures were diluted to OD600 0.075 in LBN (LB with NaCl 2.5 g/L and KNO3 1%) into medium-filled flasks plugged with non-porous caps. The medium was saturated with N2 gas by bubbling for 30 min, and the cultures were grown with agitation at 37°C. To study the impact of the carbon or nitrogen source on fdx1 expression, P. aeruginosa was grown in minimal M63 medium supplemented with 0.5% casamino-acids and with either 40 mM glucose or pyruvate, or with 15 mM ammonium or 40 mM nitrate, as carbon and nitrogen sources, respectively. Growth with p-hydroxybenzoate as carbon source was carried out in the synthetic medium described for bacteria degrading aromatics in the absence of oxygen . PCR amplification was used to produce the two fdx1 promoter fragments: primers FDX-Eco and FDX-Bam (Table 1) amplified a 555 bp fragment, and primers FDX-Eco200 (Table 1) and FDX-Bam a 237 bp fragment. The PCR products were ligated into the pCR-Blunt II-TOPO vector (Invitrogen) and sequenced. 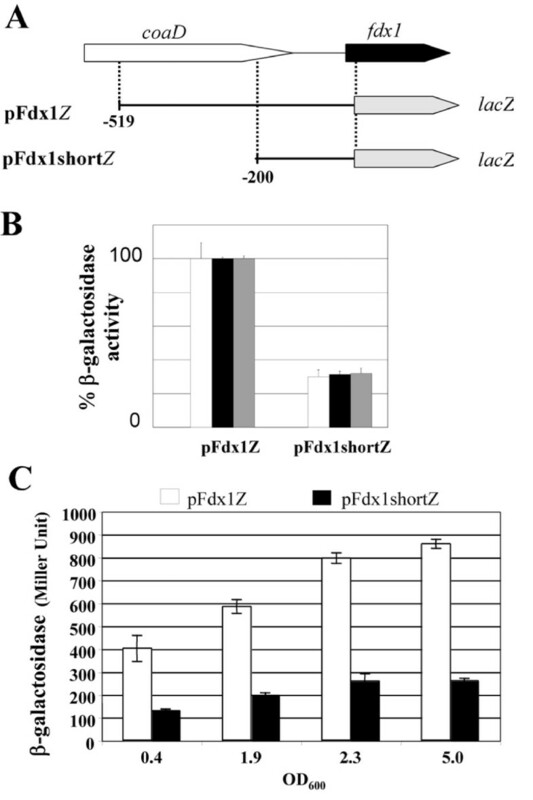 The 0.55-kb and 0.24-kb fragments were transferred into mini-CTX-lacZ , providing the pCTX-pFdx1Z and pCTX-pFdx1shortZ plasmids, respectively. The plasmids were introduced into P. aeruginosa by triparental conjugation, using the conjugative properties of the helper plasmid pRK2013 . The transconjugants were selected on PIA plates containing tetracycline: plasmids were inserted at the chromosomal ϕCTX attachment site (attB site). The pFLP2 plasmid was used to excise the Flp-recombinase target cassette as described . The corresponding P. aeruginosa strains were designated with the pFdx1Z and pFdx1shortZ extensions. Oligonucleotides used in this work. P. aeruginosa suspensions (0.5 ml) at an OD600 of 1.0 were permeabilized by addition of 20 μl of 0.1% sodium dodecyl sulfate and 20 μl of chloroform, followed by vortexing for 1 min. β-galactosidase was then assayed according to Miller , with up to 0.1 ml of cells, in 0.9 ml of Z buffer (Na2HPO4/NaH2PO4 0.1 M; KCl 10 mM; MgSO4 1 mM; 2-mercapto-ethanol 50 mM; pH 7.0) at 28°C. Reaction was initiated by addition of 0.2 ml of 4 mg/ml o-nitrophenyl-β-D-galactopyranoside and it was stopped with 0.5 ml of 1 M Na2CO3. OD420 was read after sedimentation of cell debris and the activities expressed in Miller Units [(OD420 × 1000)/(tmin × Volml × OD600)], where tmin is the length of the reaction in minutes. The DNA fragments needed for deletion experiments were amplified by the Splicing by Overlap Extension-Polymerase Chain Reaction (SOE-PCR). The upstream and downstream flanking regions of fdx1 were amplified using genomic DNA and both couples of primers, FDX-F1 and FDX-R1 (including a Xho I site), and FDX-F2 (including a Xho I site) and FDX-R2 (Table 1). Each of the two fragments of 387 bp and 396 bp, respectively, were used as template for a third PCR step using primers FDX-F1 and FDX-R2. The resulting 762 bp fragment was cloned into pCR-Blunt II-TOPO vector (Invitrogen) and sequenced: the fdx1 coding sequence between the sixth and the last 12 nucleotides was thus removed and replaced by a Xho I restriction site. After cleavage with Eco RI and treatment with the Klenow fragment of DNA polymerase I, the SOE-PCR fragment was inserted into the suicide plasmid pEX-100T  cut by Sma I, giving the pEXΔFdx1 plasmid. Of note, this plasmid contains the counter-selectable sacB marker from Bacillus subtilis, which confers sensitivity to sucrose. A 856 bp fragment, corresponding to the Gm resistance cassette, was excised from pUCGm  by Sma I, and cloned in both orientation into pEXΔFdx1 cut with Xho I and treated with the Klenow fragment of DNA polymerase I: this gave the pEXΔFdx1GmS and pEXΔFdx1GmAS plasmids. The three pEX100T-derived plasmids were introduced into the P. aeruginosa CHA strain using triparental conjugation. Co-integration events were selected on PIA plates containing Cb (pEXΔFdx1), or Cb and Gm (pEXΔFdx1GmS/AS). Insertion of the plasmid was verified by PCR using the appropriate pairs of primers. Single colonies were then plated on PIA medium containing 5% sucrose to select for the loss of plasmid: the resulting strains were checked for Cb sensitivity, for Gm resistance when required, and for fdx1 (wild-type or deleted gene) genotype by PCR. For insertion mutagenesis, a 5' fragment of fdx1 was amplified by PCR using primers FDX-F3 and FDX-R4 (Table 1) containing Sma I sites at the 5' end: in the resulting 167 bp fragment, the ATG codon was replaced by a TGA stop codon in the FDX-F3 primer. This fragment was cloned into pCR-Blunt II-TOPO vector and sequenced. After Sma I hydrolysis, the fragment was cloned into the suicide plasmid pEX100T cut with the same enzyme, yielding plasmid pEXΔFdxF3R4. This plasmid was introduced by triparental conjugation into the CHA strain and the cointegration event was selected on PIA plates with Cb. For experiments in which deletion mutants were rescued by a wild-type copy of fdx1, two plasmids, pVLT-FdxS and pJN-Fdx1, were constructed and transformed into the P. aeruginosa co-integration strains prior to sacB counter-selection. To assemble pVLT-FdxS, a 1.06-kb genomic fragment was amplified using primers FDX-F1 and FDX-R2, cloned into pCR-Blunt II-TOPO vector, and sequenced. The fragment contained the entire PA0362 ORF (fdx) and 361 bp upstream of the starting codon. After hydrolysis with Eco RI and treatment with the Klenow fragment of DNA polymerase I, the PCR fragment was inserted into the replicative plasmid pVLT31  cut by Sma I, in the same transcriptional orientation as that of pTac, leading to pVLT-FdxS (Tc resistance). To construct pJN-Fdx1, a 308 bp fragment encompassing PA0362 was amplified using primers FDX-PstI and FDX-XbaI (Table 1), cloned into pCR-Blunt II-TOPO vector, and sequenced. The fragment was hydrolyzed by Pst I and Xba I and cloned into the replicative plasmid pJN105  cut with the same enzymes. This gave the pJN-Fdx1 plasmid in which the fdx1 gene is under the control of pBAD (Gmr). The co-integration strains were transformed with the pVLT-FdxS or pJN-Fdx1 plasmids and grown on PIA-Sucrose 5%-Tc or PIA-Sucrose 5%-Gm-Arabinose 2%, respectively. The selected SucR et CbS clones were analyzed by PCR as in Figure 5. To study expression of the fdx genes, total RNA from harvested bacteria was extracted with the Trizol reagent (Invitrogen, Carlsbad, CA, USA). Absence of co-purified genomic DNA was assessed by PCR reactions using 100 ng of extracted RNA as template: the absence of any amplified band was taken as evidence for removal of contaminating DNA. Northern blot analysis was performed using the glyoxal method . Equal RNA loading (~5-10 μg) was based on both optical density measurements and estimates of the amounts of rRNA . [32P]-dCTP-labeled, fdx1-specific, DNA probe was prepared by random hexanucleotide-primed synthesis. [32P]-dCTP (3000 Ci mmol-1) was purchased from the Institute of Radioisotopes & Radiodiagnostic Products, NCSR Demokritos, Athens, Greece. In RT-PCR experiments, complementary DNA synthesis was carried out with an engineered version of the Moloney Murine Leukemia Virus reverse transcriptase provided in the RevertAid™ H Minus First Strand cDNA Synthesis Kit (Fermentas, St Leon-Rot, Germany) and a random hexamer primer. Calibration of the PCR amplification step was done by first using a range of template cDNA over a varying number of cycles with primers targeting either the fdx transcript of interest or rRNA as a reference transcript. Comparison between samples was then obtained by loading non-saturating amplified DNA on 3.5% agarose gels. Sequence comparisons were performed with various versions of the Blast program at NCBI http://blast.ncbi.nlm.nih.gov/Blast.cgi. Genome searching made use of the tools available at the Comprehensive Microbial Resource web site (Data Release 21.0 at http://cmr.jcvi.org/tigr-scripts/CMR/CmrHomePage.cgi. The AlvinFdx family was defined by the 6-8 amino acids insertion between two cysteine ligands of cluster II and the C-terminal piece of ca. 20-40 amino acids following the cluster-binding domain (Figure 1). This work received support from the Greek-French program Plato and a CNRS (French Centre National de la Recherche Scientifique - PICS)-GSRT (Greek General Secretariat of Research and Technology) grant N°3335. PP received a grant from the Greek State Scholarship's Foundation (IKY). The authors thank H.P. Schweizer and C. Fuqua for the gift of the mini-CTX-lacZ and the pJN105 plasmids, respectively, and I. Attree for her interest in this work. PP thanksDr S. Amillis for help and guidance with some experiments. Peter Robinson is thanked for suggestions about the use of English in the manuscript. This paper is dedicated to Dr Jacques Meyer on the occasion of his retirement: his mentoring and guidance into the field of iron-sulfur proteins and beyond have been much appreciated over the years. SE participated in the design of the study, carried out the molecular genetic experiments, interpreted the data and corrected the manuscript. GE carried out some RT-PCR experiments. PP carried out the Northern-Blot and some RT-PCR experiments. GD participated in setting up the Northern-Blot experiments, interpreted the data and corrected the manuscript. PK participated in the design of the study, sought financial support, participated in setting up experiments and corrected the manuscript. JMM designed and coordinated the study, sought financial support, participated in setting up experiments, performed database queries, interpreted data, and wrote the manuscript. All authors read and approved the final manuscript.